"Track Capital of the World", "The Hill"
Fayetteville is a city and county seat of Washington County in the state of Arkansas in the United States of America. 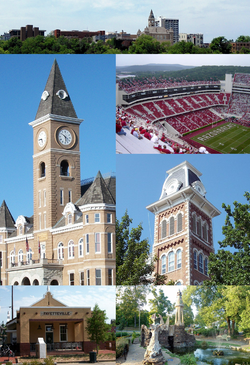 It is also home to the University of Arkansas, which is the state's largest university. ↑ "Comprehensive Arkansas Higher Education Annual Report" (PDF). Arkansas Department of Higher Education. December 1, 2011. Retrieved July 20, 2013. This page was last changed on 10 April 2019, at 05:23.